A national plan on island protection and exploration has officially gone into effect, the State Oceanic Administration (SOA) announced Thursday. 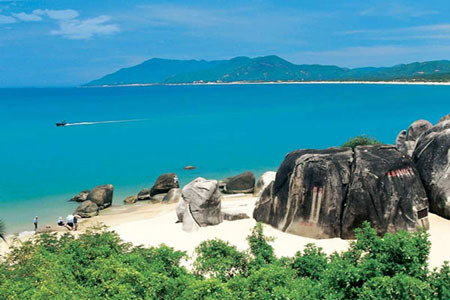 Hainan Island, located in the south of China, is a well-known tourist resorts. Approved by the State Council, or China’s Cabinet, the plan aims to strengthen protection and rationalize exploration of China’s island resources. The large numbers of islands have become increasingly significant to China’s marine economy and national defense, but their sustainable development has been impeded because of disorderly exploration, noted the plan. Considered a guideline document for fine-tuning island exploration, the plan focuses on strengthening protection of sea islands’ ecosystems, gradually standardizing exploration and improving the habitation environment by 2020. Sound measures have been meted out for investigating and appraising the ecosystems and resources on the islands, and restoring damaged ecosystems. Lu Caixia, head of the island administration department of the SOA, said the SOA has urged local branches to finish the formulation of corresponding island protection regulations at provincial level this year. Lu also said China is advancing the registration and authorization management for the use of unpopulated islands, as well as formulating a plan to tap the island tourism, which she deemed to be a new growth point for the nation’s tourism industry.